As you may recall, we previously reported on a decision issued by the National Labor Relations Board (“NLRB”) wherein the NLRB held that an employer may not prohibit its employees from speaking about their wages. Now, the NLRB has issued another decision which reflects on this same issue. In this case, an employee was discharged after engaging in an outburst during a meeting with the company’s owner. Prior to that meeting, the employee had repeatedly complained about his wages and commission. The employee had spoken with other employees about his concerns and had also spoken with the office manager, who had allegedly told him he could always work elsewhere. Thereafter, the owner of the company met with the employee to discuss his negativity. The owner indicated during the litigation that he did not intend to fire the employee when the meeting started, but that he changed his mind based on the employee’s behavior during the meeting. The employer allegedly told the employee during the meeting that the negativity must be discontinued and he should not complain about his pay. The employee allegedly continued to complain about his wages and the calculation of the commissions. The company owner then allegedly reminded the employee that he could work elsewhere if he did not trust the company. It is alleged that the employee then lost his temper and engaged in an outburst during the meeting which included cursing at the company owner. Following this outburst, the employee was discharged. This case has been in litigation for over five (5) years and has a extenuated history. However, the most recent decision, which was issued by the NLRB, found that the employer violated Section 8(a)(1) of the National Labor Relations Act (“NLRA”) and ordered the dealership to immediately reinstate the employee with seniority and to pay the employee for any loss of earnings and other benefits. 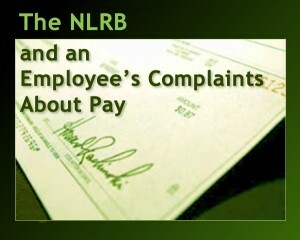 Although the NLRB acknowledged that the company did not intend to terminate the employee for his protected activity going into the meeting, the NLRB excused the employee’s outburst during the meeting on the basis that the employee was “provoked” into his outburst by the employer discouraging him from speaking about his pay. The NLRB further held that although this was only one employee complaining about his pay, it is still considered protected activity under the NLRA as compensation issues affect all employees. This decision stresses and reaffirms the NLRB’s current position regarding an employee’s right to speak about his/her pay even when the employer is non-union. Therefore, I caution employers to be careful when treading into situations involving an employee’s complaints and/or dissatisfaction about pay related issues. This decision is still subject to review on appeal and could be subject to further litigation. Nevertheless, this decision further confirms the NLRB’s current interpretation of the law.